What's new on this blog... just before my tribute to Matthew Yuricich I'll outline a few new things of note. One, is that summer is just around the corner and the weather is getting nice and warm and the days long - which always screws the minds of northern hemisphere types, which comprise most of the visitors to this blog. 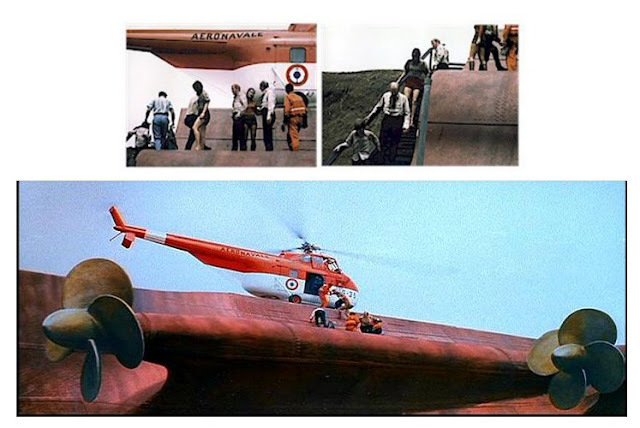 There are a number of additions to pages in the blog such as some pictures of one of the surviving original mattes from THE GREAT RACE, supplied by visual effects cameraman and stop motion guru Jim Aupperle. thanks Jim. Also I've loaded a number of extra pictures into the popular War Films blog that were initially omitted due to space and concentration span concerns for those who might visit the page. The Warner page has some more as well, such as the clifftop matte shots from NOW VOYAGER. 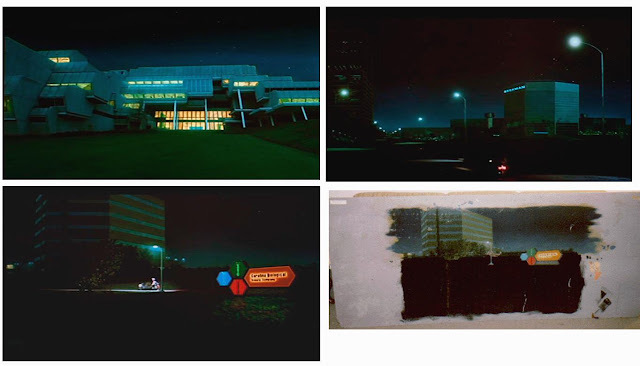 On matte shots - I'm always extremely interested in hearing from anyone who may have original paintings, images of paintings or screen shots of matte effects that they'd be willing to share and have 'on show' (as all great mattes should be). The purpose of my blog after all is to bring this lost artform into the public eye and above all else to celebrate the artisans behind these great shots. 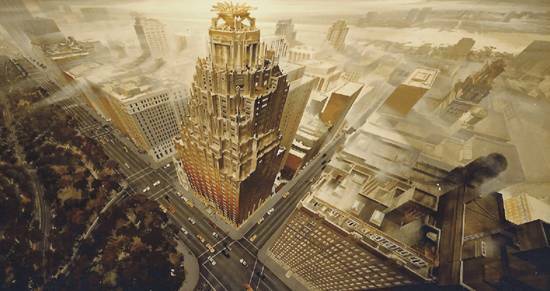 I'm now the proud owner of not one, but two golden era Warren Newcombe matte paintings from MGM. This brings my grand total to, well let me see.....'two'. It's a thrill to have a couple of pieces of Hollywood visual effects history right here in my grasp. The paintings never fail to inspire me, especially as they are from my favourite period of matte art, the 1940's, where studios such as Metro went all out creating vast numbers of cinematic scenes and shots through the very busy matte department. 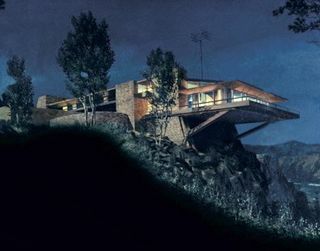 Things dropped off considerably in the following decade with the numbers of matte shots reducing steadily due to a more location based sensibility rather than relying on the studio artisans to create the mood. It is with great pleasure that I present today's special tribute... to one of the least ever screen credited, some might even say, criminally under-credited though without a doubt incredibly industrious movie matte magicians - Matthew Yuricich. I have a large number of great matte shots images here, which as usual I'm forced to go through and prune the material to a reasonable length. 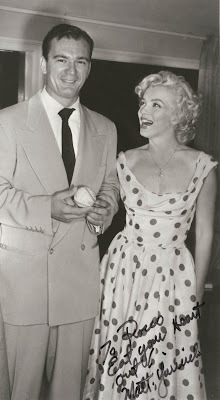 If ever there was an utterly unforgettable snapshot of a film technician in the old Hollywood era, it has got to be this wonderful picture at left of Matthew with a certain Marilyn Monroe, taken at a Fox studio function in the mid fifties. The photo, courtesy of Rocco Gioffre is humouresly inscribed "To Rocco...eat your heart out...Matt Yuricich". A gem! 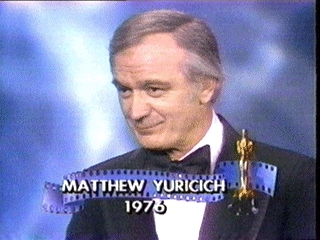 It's been difficult over the years in trying to put together an accurate list of film credits for Matthew, with even imdb being somewhat lean in film credits until fairly recently when I noticed a number of hitherto unknown titles starting to appear on Matt's listing. Naturally none of this is helped by the fact that Matt barely ever received any sort of screen mention of any kind as he was never a head of department - at least not until very late in his career in the late 80's. It's a fairly safe bet though that Matthew had input into various aspects of matte work and the gag effects employed on many 20th Century Fox pictures from around 1950. By his own account Matt never dreamed of getting into movies, and as with many of us, he more or less slipped into his vocation more or less by accident. Following demobilisation after WWII, Matt pursued a degree in fine art with the notion of gaining work in any sphere of art if possible. As chance would have it Matt found his way onto the 20th Century Fox lot in 1950 as an assistant in Fred Sersen's large and highly regarded camera effects department. 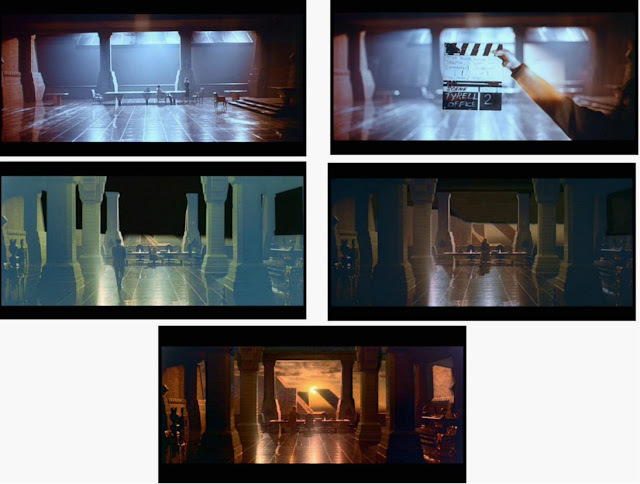 By Matt's own admission, the role of an assistant "wasn't one of glorious artistic achievement" and he spent a fair amount of time in those early years learning and carrying out the intricate and time consuming process of rotoscope preparation for photographic effects shots with fellow budding matte artist, Jim Fetherolf. 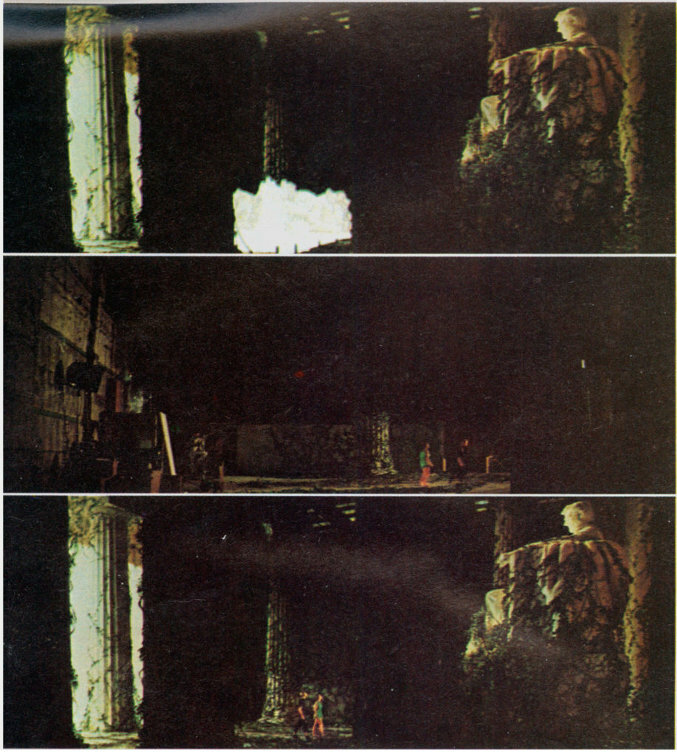 The roto sillouettes were usually drawn and inked on large sheets of glass to correspond with the matte painted glasses prepared elsewhere in the department. These early times saw Matt and Jim looking after a particular aspect of matte effects work which has always been of great interest to me both as a film enthusiast and a matte shot fan, that being those wonderful glittering neon lit theatre marquees which featured so prominently in films from the 30's through to the late 50's. Said Matthew in 1977: "Jim Fetherolf and I used to paint all the theatre marquees used in motion pictures and we even animated all the lights. We would do the simpler mechanical functions and being younger and steadier we did the animation and travelling mattes because we had a little more patience needed to stick to the frame by frame process". 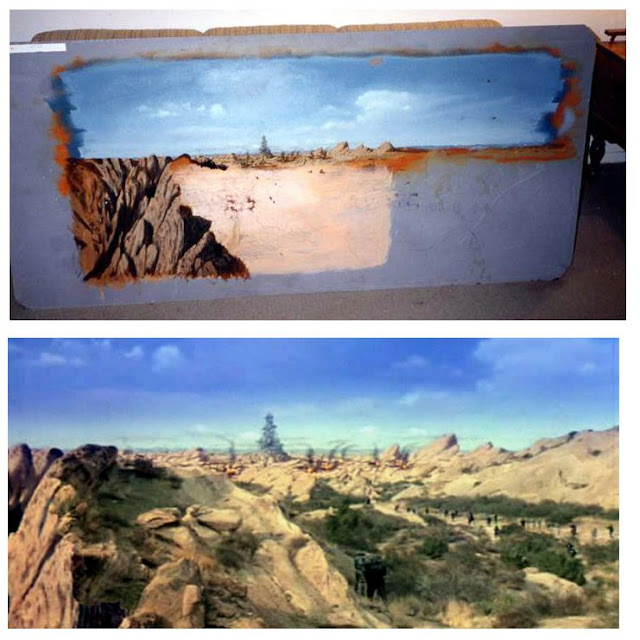 Gradually Matthew moved into actual matte painting at the studio and worked on a number of pictures over the four years with Fox. 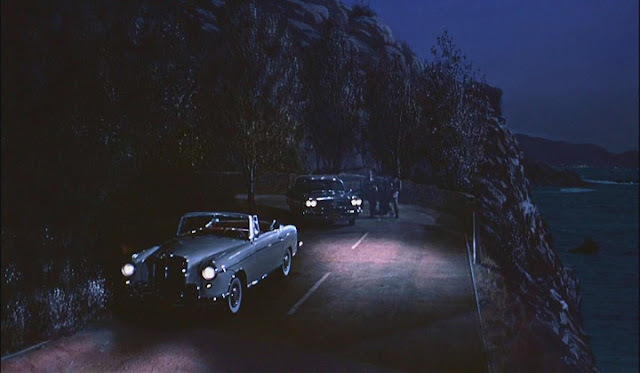 Circumstances at Fox lead to the departure of some of the matte artists and effects cameramen, with Lee Le Blanc, Clarence Slifer and Matthew all seizing upon the opportunities available at rival studio Metro Goldwyn Mayer, with LeBlanc eventually assuming headship of the matte department following Warren Newcombe's retirement. 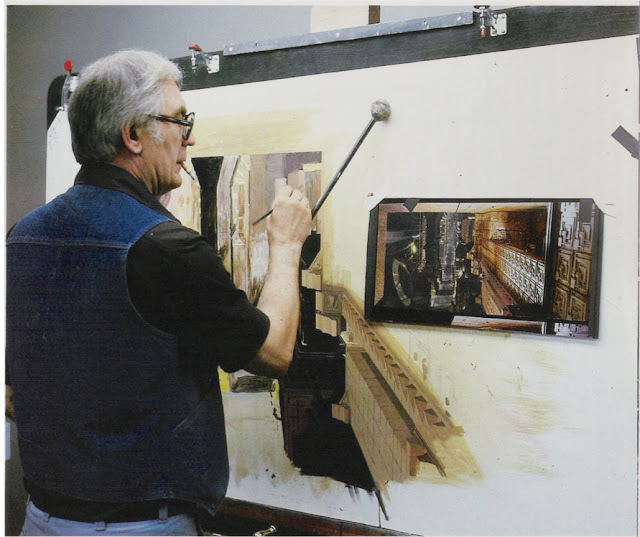 Matthew stayed with the studio for many years working on everything from BEN HUR to SOYLENT GREEN before taking on many independent matte jobs following the closure of the MGM matte department in the mid 70's. 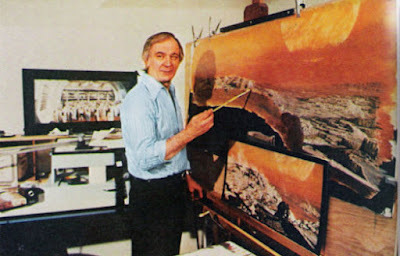 Matt painted for Warner Brothers on shows such as DOC SAVAGE, MAN OF BRONZE for scenes involving Ron Ely's North Pole hideout, and on films such as VIVA KNIEVEL where he painted in a mountain and train tunnel for an important stunt sequence. 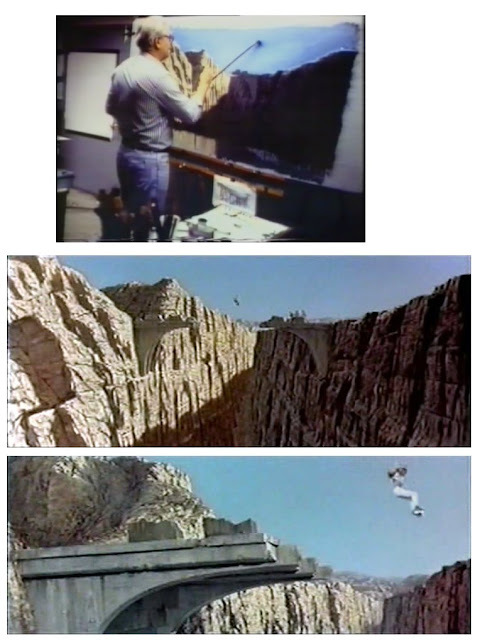 Other shows Matt painted on included the perennial Jan-Michael Vincent trucking action movie WHITE LINE FEVER where he supplied the Arizona desert headquarters , 'The Big W', of bad guy L.Q Jones. It was the science fiction film LOGAN'S RUN though that got Matt one of his biggest gigs, and brought his up until then, largely unknown name into the limelight. 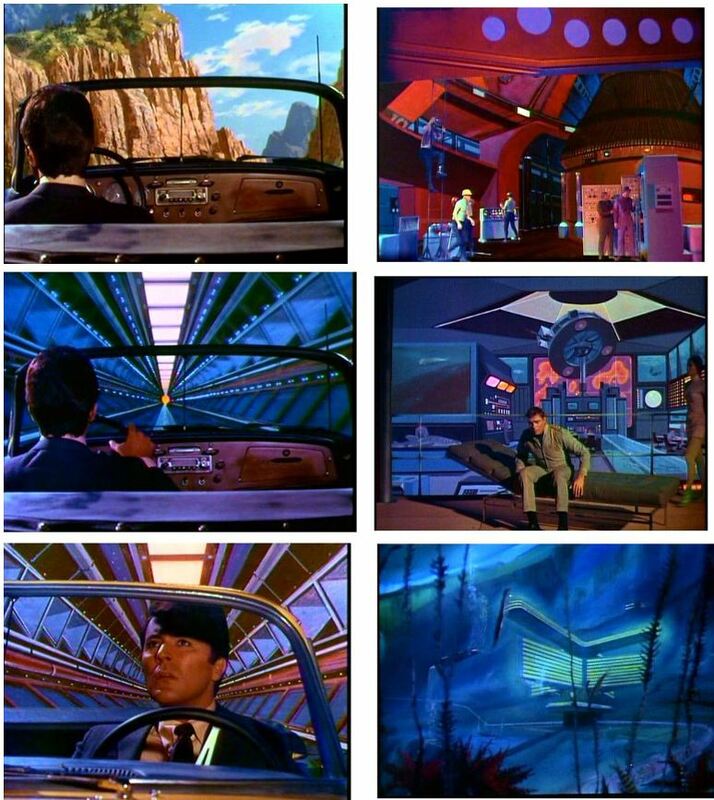 Matthew must be the only golden era matte painter still alive today, with as far as I can determine all of his generation of matte men now gone. Last I heard from Matthew's former assistant and close friend Rocco Gioffre, Matt is still chugging along at 86 and doing well, living I believe in Washington State. So, with that introduction I'm happy to present a photo album of memorable Matthew moments from his long and distinguished career. I hope you enjoy it. 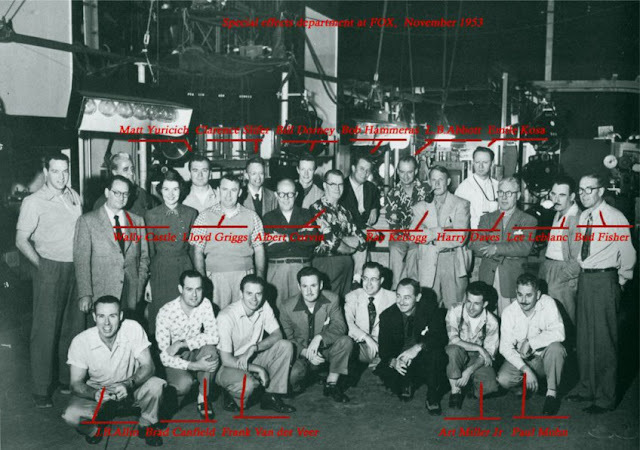 The vast, proud 20th Century Fox special photographic effects department around 1953 under Ray Kellogg's control featuring a veritable who's who in visual effects with important names as Bill Abbott, Emil Kosa, jr, Clarence Slifer, Lee LeBlanc, Frank Van Der Veer, Robert Hammeras and of course a young Matthew Yuricich.... all names that are instantly recognisable to students of special effects history - and all of whom made a mark in the art and science of camera effects. Visual effects cameraman Clarence Slifer would work often photographing Matt's paintings over the years. 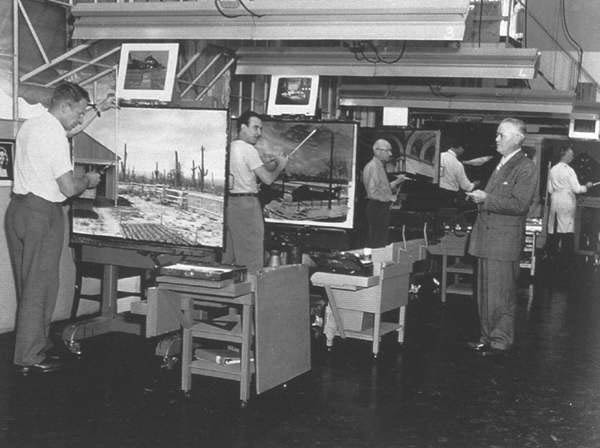 One of my favourite photographs: the 20th Century Fox matte painting studio taken around 1950, just before Matthew's tenure, with, from left Ray Kellogg, Lee Le Blanc, Cliff Silsby, Emil Kosa jr, Max De Vega and lastly long time head of photographic effects, the great Fred Sersen standing at right. Steven Spielberg's epic comedy 1941 (1979) featured every type of special effect imaginable - from Lydecker flying rigs, gargantuan mechanical effect gags, blue screen, front projection and some Yuricich matte painted additions such as this fictitious amusement park added to the upper left of the frame. Also from 1941 - Matthew's lush painting of period Los Angeles. 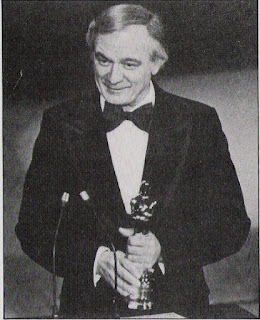 The film was one of five contenders for the visual effects oscar in 1979, though despite the excellent work throughout (particularly the miniatures) the film lost out to Ridley Scott's ALIEN - a pretty tough call that year, but probably the right one. Matt's finished effects shot from 2010 with beautifully composited smoke and dual sun opticals. Matt's epic money shot from BEN HUR (1959) - a true masterpiece which I dearly hope survives today. 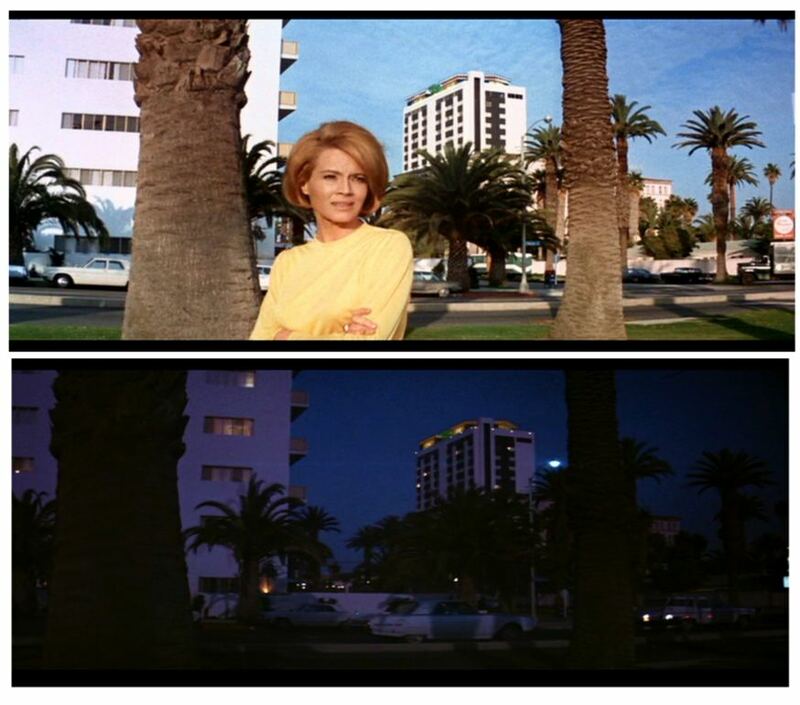 Painted with a carefully worked out partial 'squeeze' to facilitate later conversion to the MGM Camera 65 process. For much more on Matt and Lee Le Blanc's work on this film, click here. 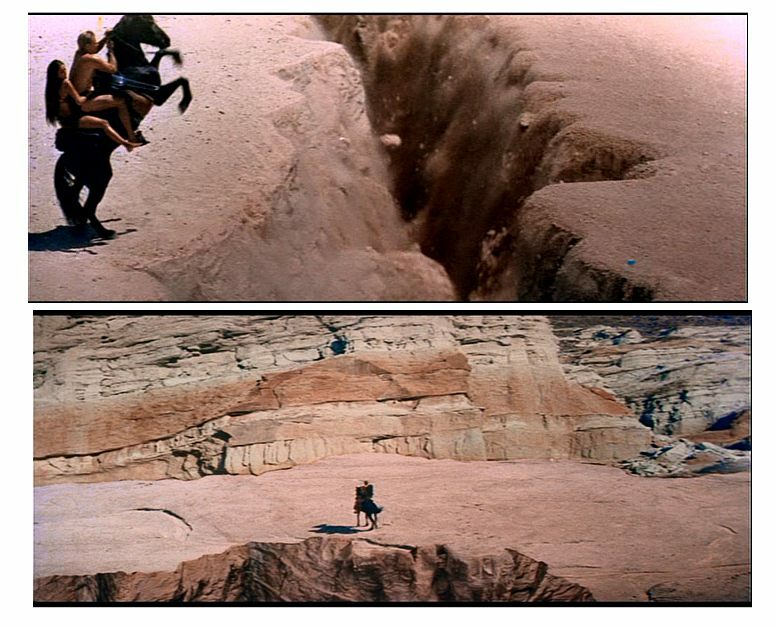 Interestingly, Matt spoke of the difficulties encountered in compositing some of the BEN HUR shots due to unsteadiness of the location plates as a result of wind blowing the parallels - "We had to take out that movement frame by frame and plot it. Then when we photographed the painting we had to move it to those corresponding numbers, vertically and horizontally, for each frame. 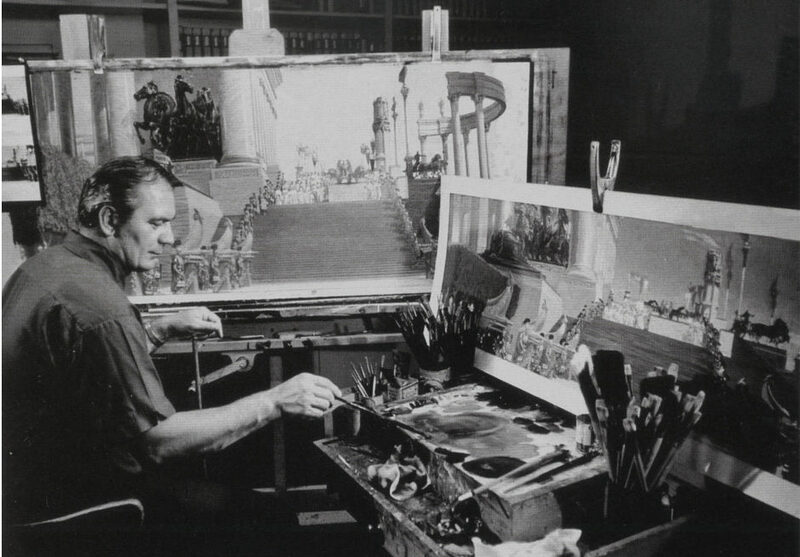 They save a thousand dollars not having anyone on location, and spend a hundred thousand dollars trying to fix it at the other end"
Matthew at work on one of his BEN HUR matte shots. 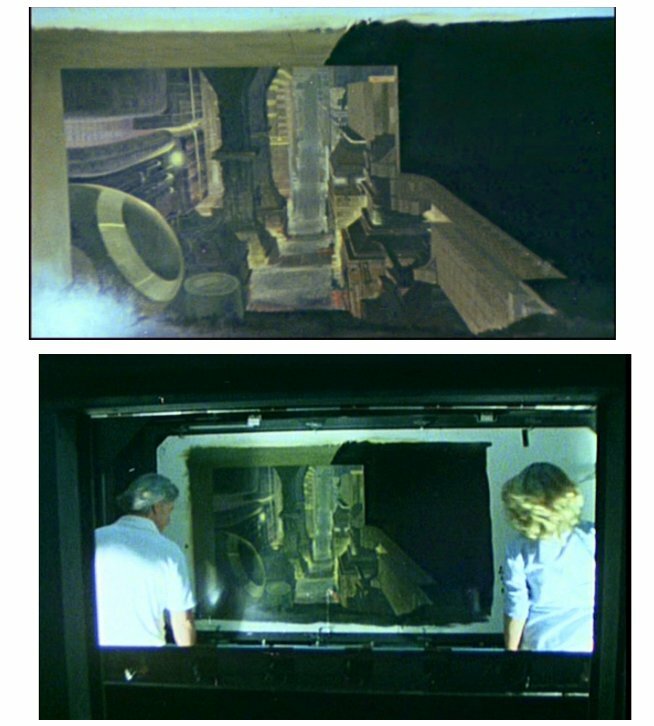 Note the partially squeezed aspect of the central glass painting in comparison to the correct dimensions of the final draft painting seen at the right designed for the Camera 65 ultra widescreen format. The final glass painting outer detail is noticeably compressed vertically yet the central area of the matte is relatively normal in appearence. This was an unwelcomed necessity due to lens artifacts inherent in the CinemaScope anamorphic camera optics of the era, whereby mattes needed to painted with a partial squeeze introduced into the actual painted artwork to compensate. 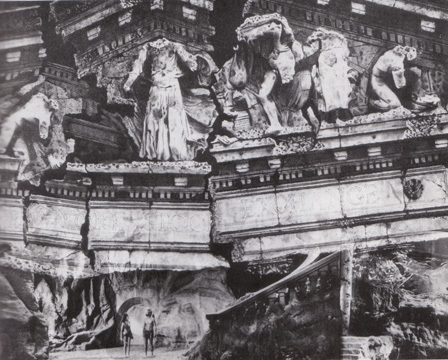 This required enormous expertise and draftsmanship on the part of the matte artist and cameraman to ensure proper and natural unsqueezing in the final release print. On BEN HUR Mathew worked with veteran cameramen Cliff Shirpser and Clarence Slifer. Yuricich and Slifer had a long and fruitful working relationship over some twenty five years. Although I can't confirm it, I'd be fairly confidant in saying Matthew painted on THE BROTHERS KARAMAZOV under Lee LeBlanc in 1961 as he was a vital member of the MGM effects unit throughout the sixties and beyond. 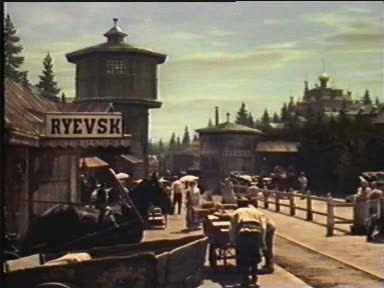 Another matte shot of Russia from THE BROTHERS KARAMAZOV - though I've only got old vhs images from it. 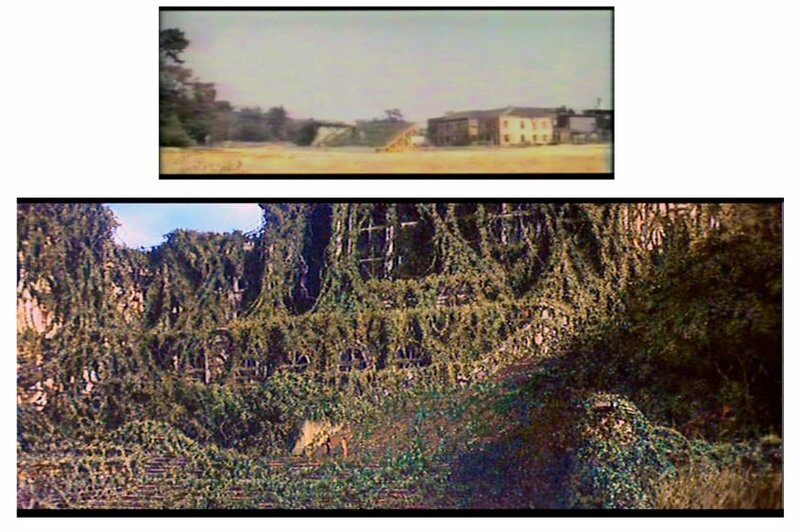 Now this, I know that Matt painted - one of a number of shots from three of the APES films, with this being from BATTLE FOR THE PLANET OF THE APES (1974), with a lovely Blu Ray capture detailing Matt's work. Another 'Matt matte' from BATTLE FOR THE PLANET OF THE APES - easily the weakest of the series, unless of course you count that godawful abomination made by Tim Burton a couple of years back. Man, I loved this film as a teen, and would always go off to see it wherever it played - BENEATH THE PLANET OF THE APES (1970). Filled with great Bill Abbott and Art Cruickshank optical effects, freakin' fantastic mutant make up by the great John Chambers which was waaaaaay nasty for it's day - and of course quite a few Yuricich matte shots of post apocalyptic New York City. The above shots are a nice L.B Abbott earthquake, and following it, one of Matt's painted fissures in the earth and a painted rock face. Another terrific Blu Ray matte grab - from the same movie. A classic effects shot still! 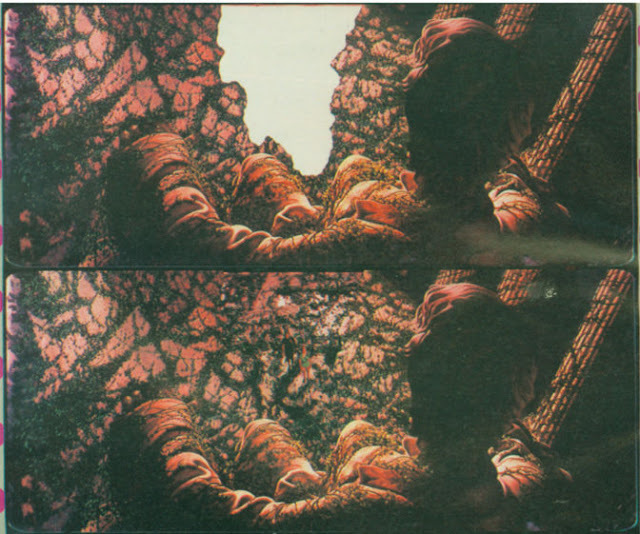 More Yuricich mattes from BENEATH THE PLANET OF THE APES (1971). Some say that Emil Kosa painted on this, which is incorrect as he had passed away a few years earlier, right after the first APES film I believe. The NYC Stock Exchange scene as seen above - though I suspect this is a publicity paste up photo. Mattes from the decidedly poor second fiddle sequel in the BILL AND TED franchise. 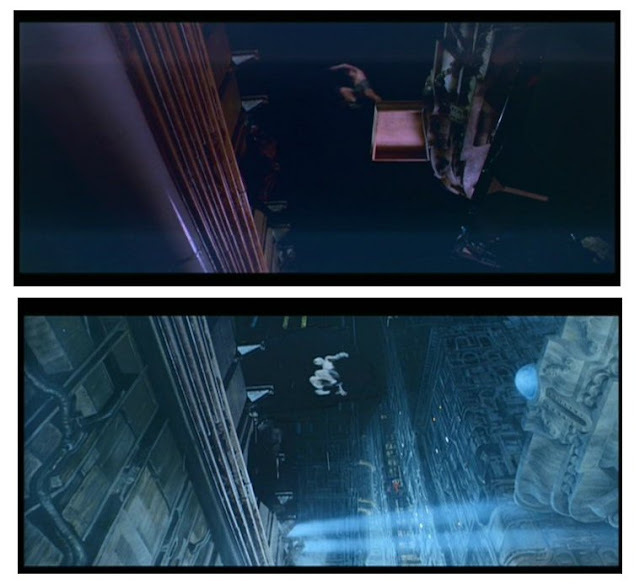 Now, I have so many great BLADERUNNER images it was a tough call as to which ones to use. A pretty good film (never quite 'great') but one of the all time finest examples of old school photo chemical visual effects work. The Doug Trumbull work in this show is 100% magnificent in my book with each and every effects shot so beautifully designed, conceived and manufactured it is a joy to behold. The classic EEG frontlight/backlight matting techniques were beautifully employed and left competitor blue screen shows in the dust to my mind. Oh how I miss this care in effects design and restraint...so missing from today's migraine inducing effects washouts. A sensational photo of Matthew painting his favourite shot in the film - with his polka music playing in the background. The finished painting, executed to conform to the peculiarities of the Trumbull nominated method of doing all mattes on internegative 5253 duping stock. Matt, though highly experienced in this little used method, hated working with the process. 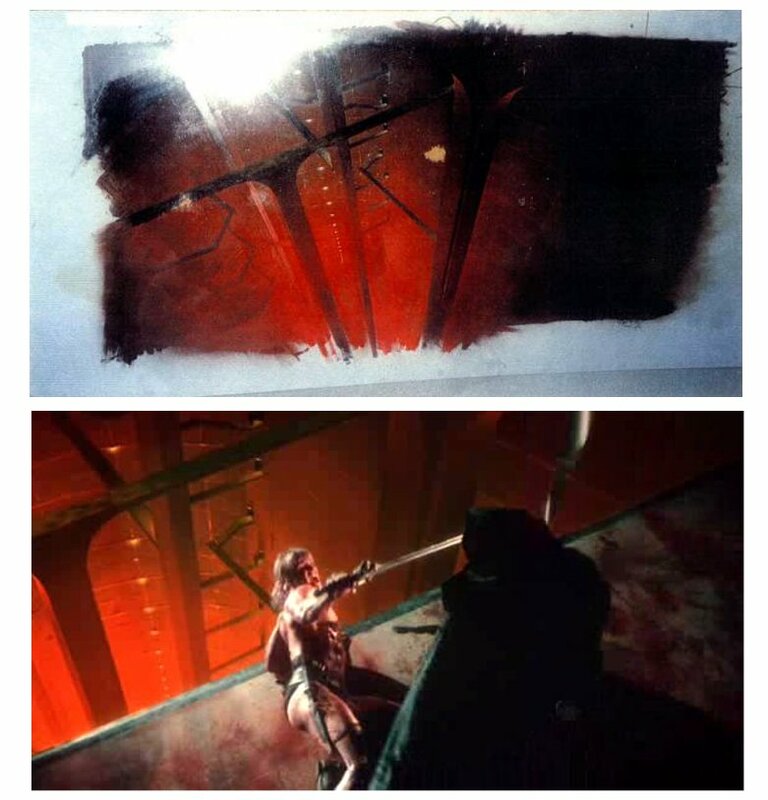 In an interview Matthew said "...you have to put very little contrast into the painting because the film builds it up with 30% more contrast. You hve to keep painting and experimenting until, when it's done, you have a collage of colours which make the painting look kind of sick. When it's photographed it looks pretty good, though there are variations within batches of 5253 (film stock) which requires much retesting from batch to batch" Matt had much experience with this stock and had used it frequently, though not of his own choice, on many shows from BEN HUR up to BLADERUNNER, and in fact used to complain to his brother, effects cinematographer and frequent collaborator Richard Yuricich, for lumping him with this 'dupe' stock all the time for the mattes on show after show. The final composite from the painting shown above. One of my favourite shots from BLADERUNNER - a beautifully designed and composed shot utilising a front projection plate of Matthew's painted sunrise, some subtle rotoscoping around the actor's head to facilitate a sun flare element. by cameraman Bob Bailey Artistically, the film is flawless, with magnificent Jordon Cronenweth lighting and eerie, ethereal score by Vangelis and with a deliberate pace that works in it's favour. 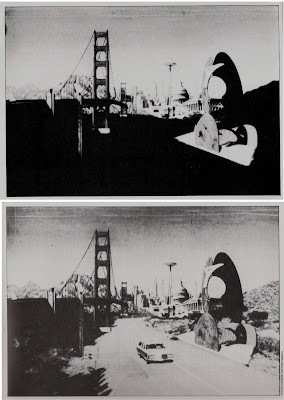 A great before and after shot of a matte effect that lasts barely two seconds in the final print. I'm unsure as to whether Rocco Gioffre painted this, or if it was a collaboration between Matt and Rocco. CLOSE ENCOUNTERS OF THE 3rd KIND (1978) saw Matthew on retainer to fix up or enhance a great number of production shots such as the frame above where he painted in the fenceline and trees to the left of the crashing police car. Again, from CE3K, one of the big Yuricich matte shots - of which a number occur during the climax of the film. 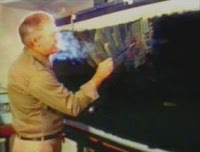 The original Yuricich multi plane glass paintings set up on the matte stand for cameraman Don Jarel. 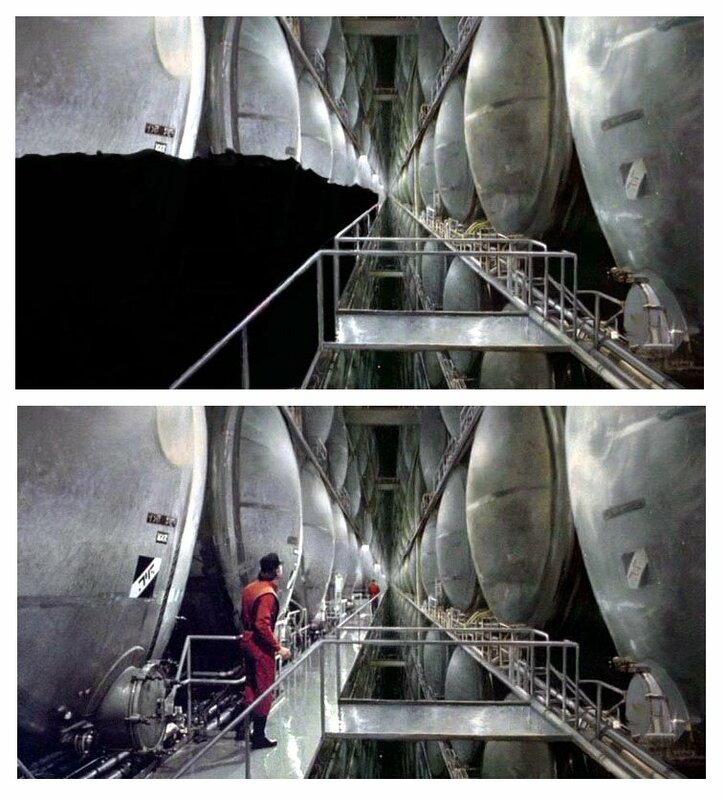 On CE3K Matthew enlisted the aid of budding matte artist, and fellow hometowner Rocco Gioffre as apprentice. Gioffre handled many of the gags and painted a few shots such as the runway lights under Matthew's supervision and would himself become one of the finest glass painters in the industry within just a few short years. 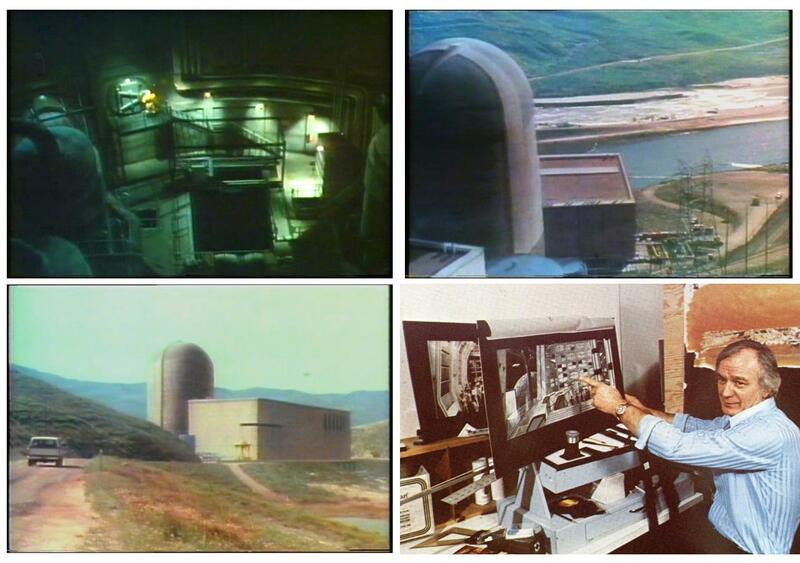 Three Yuricich mattes of the nuclear reactor (two of which had subtle camera moves employed) from the gripping film THE CHINA SYNDROME (1978). Lower right shows Matt with some STAR TREK conceptual paintings. 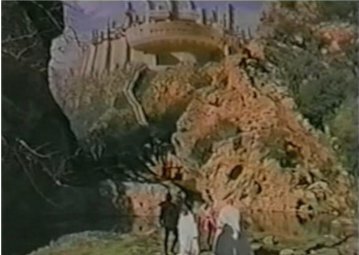 Another APES picture - this matte shot is from the forth installment CONQUEST OF THE PLANET OF THE APES (1973) - a film I'd like to see in an unedited version as it lost alot of violence to the MPAA I understand. 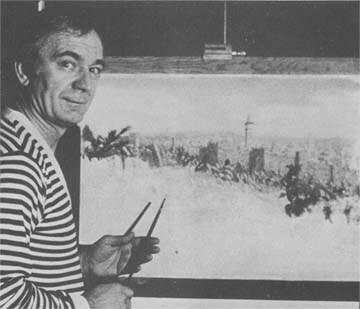 Another frame from the Yuricich opening sequence from the above film. 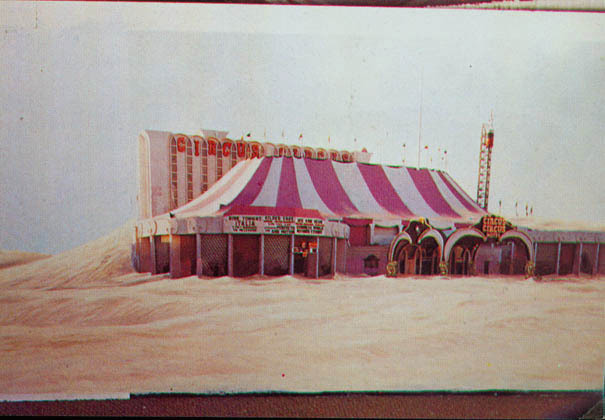 A rare glimpse at one of Matt's actual paintings of post apocalyptic Las Vegas from the 1977 science fiction yarn DAMNATION ALLEY. According to protege Rocco Gioffre, Matt employed photo blow ups for several matte shots with extensive painted alterations to the landscape to striking effect. Matt would use this method on many films over his career especially on his early MGM pictures. 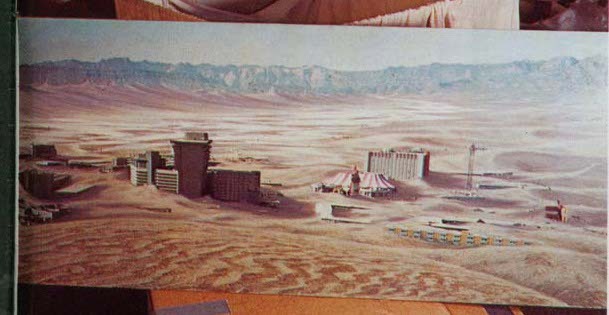 Another rare photo of a DAMNATION ALLEY matte painting atop a large photo blow up. 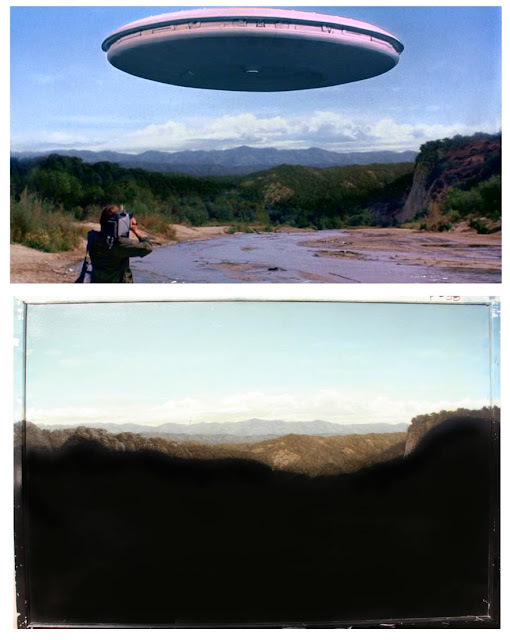 According to Rocco Gioffre, during quieter moments on the effects shoot of CLOSE ENCOUNTERS Matthew would lean across and whisper to Gioffre "close the door" and then work on the DAMNATION ALLEY mattes unbeknownst to Doug Trumbull. Rocco also assisted on these paintings. 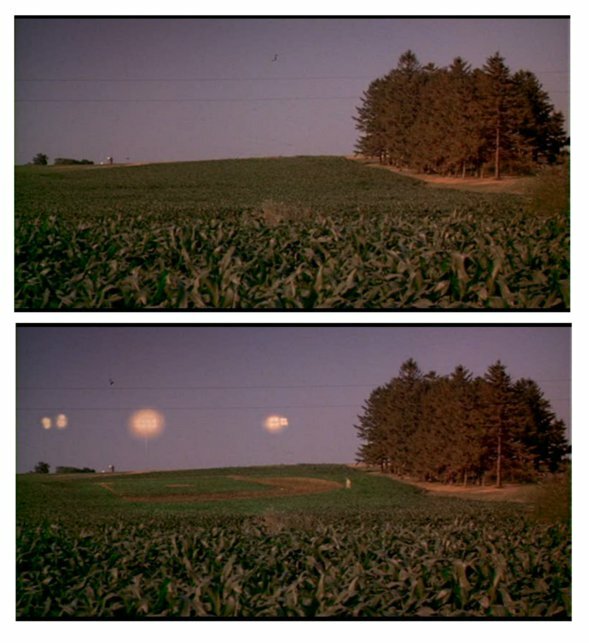 Sadly the finished film was anything but remarkable, though it sure entertained me as a teenager despite the overabundance of poorly executed overall effects shots of giant scorpions and shaky rotoscoped flaming skies throughout. What was that great line by Darth Vader to Obi Wan... something like "I was the student then, but now I am the master" ..or something along those lines... well come the late eighties Rocco Gioffre was now hiring Matthew as his painter on a number of shows, including this big oscar winner DANCES WITH WOLVES (1990). The above matte shot was Yuricich's, with 'boss' Gioffre telling me how delighted he was with Matt's blending and matching of the painting to the original negative plate. 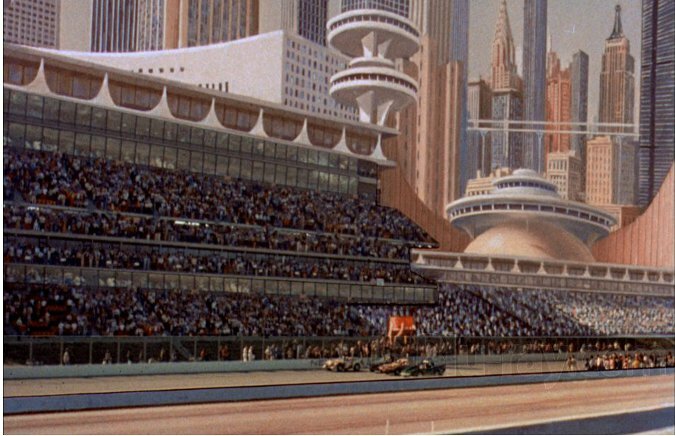 An iconic Yuricich matte shot as seen in the low budget Paul Bartel gem DEATH RACE 2000 (1975) from Roger Corman's low rent outfit. This was a subcontract by way of Jack Rabin, an equally low rent optical house who by his own business plan felt that he could make a buck by sheer turn over rather than quality. A couple of interesting shots here - from Kevin Costner's FIELD OF DREAMS (1989) whereby the mighty ILM were unable to pull off a shot where a mythical baseball stadium appears within a corn field even after extensive attempts with live elements and so forth, thus forcing the director to call in Yuricich and his brother to quickly knock together a couple of shots, which satisfied the director's needs perfectly. 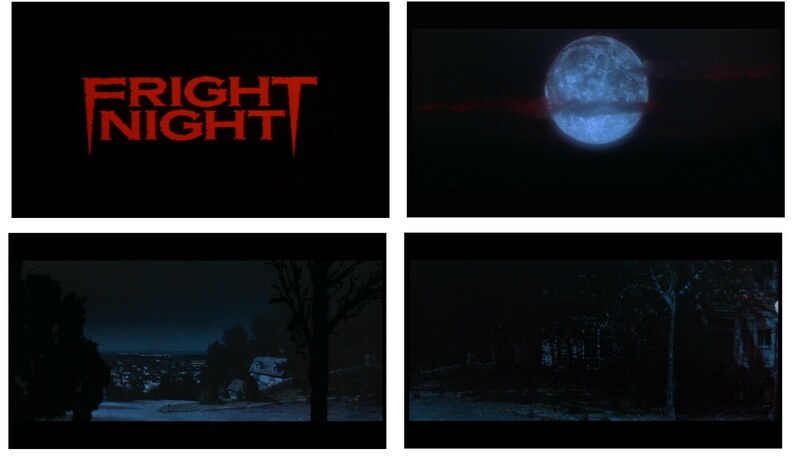 According to the commentary track by the film's director on the DVD, these shots were done a day before the negative had to be 'locked'. 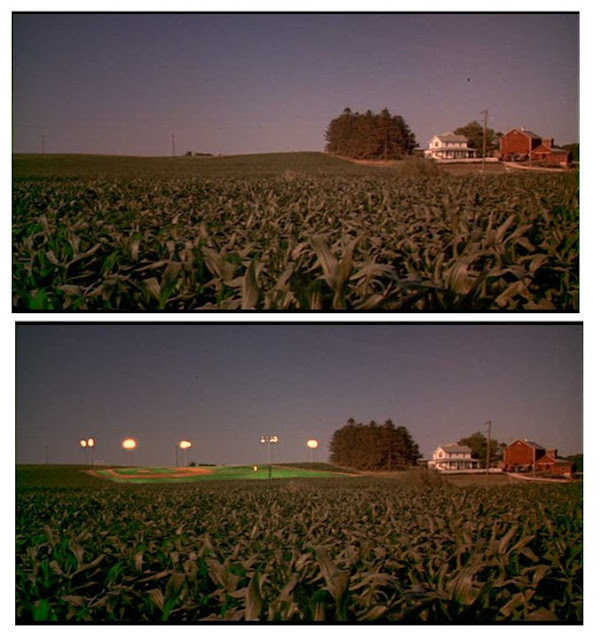 Matthew's other painted shot from FIELD OF DREAMS of a vast cornfield covered in snow. 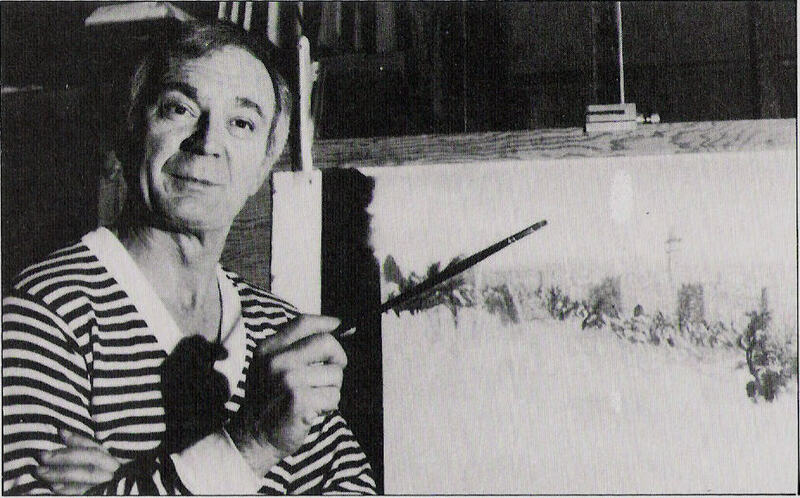 Yuricich with assistant Michelle Moen painted in this city view at the end of a backlot studio street for FRIGHT NIGHT. 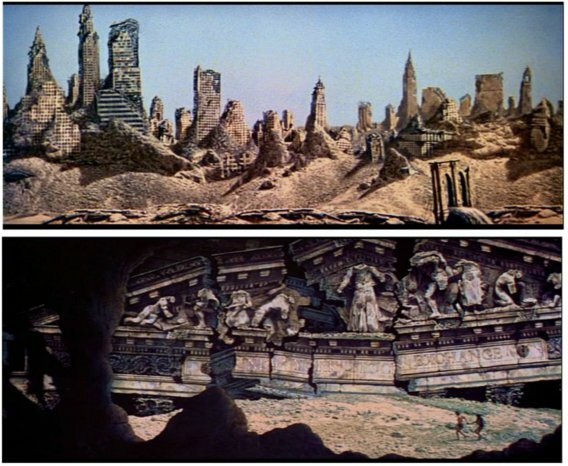 FORBIDDEN PLANET (1956) - One of Matt's first prestige jobs, and one whereby he found his mentor in the matte painter Henry Hillinck. 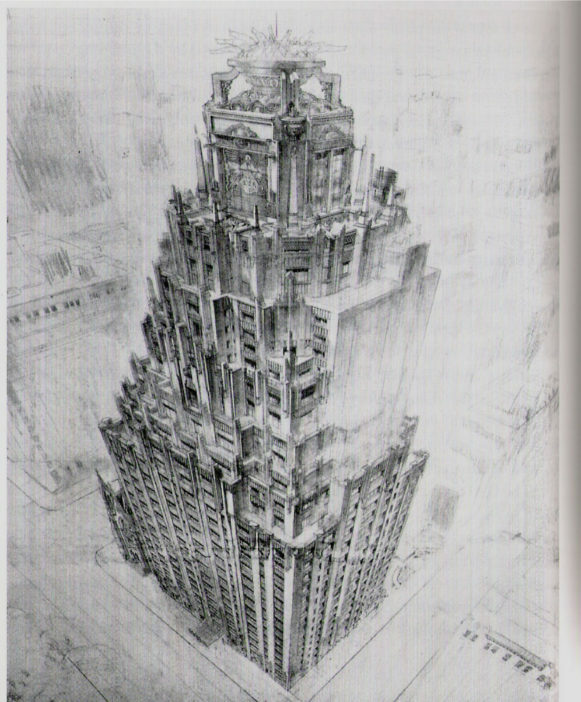 Hillinick was a long time MGM and RKO matte artist with roots as far back as the original KING KONG in 1933. Many of Henry's techniques stuck with Matthew and were in his bag of tricks thereafter. 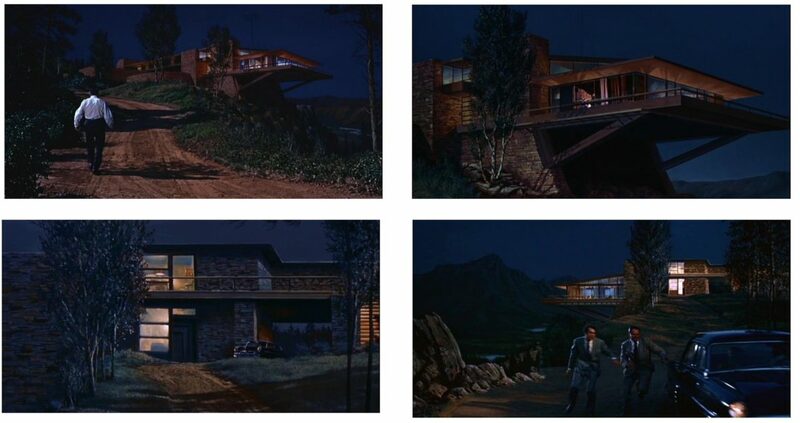 This matte was actually one of Hillinick's with Yuricich just assisting on various lighting effects and bits of animation for the nearly half dozen painted mattes. 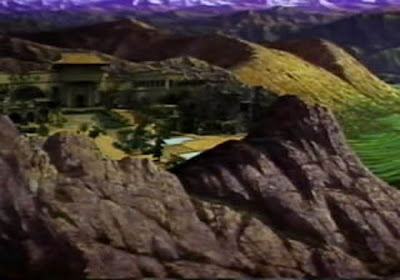 One of the few FORBIDDEN PLANET matte paintings to survive - an early Henri Hillinick rendering which Matthew assisted on. I'm unsure who actually painted this, though possibly Matt had a hand in it under Warren Newcombe. *Update: it was painted by Henri Hillinick so I've recently discovered. 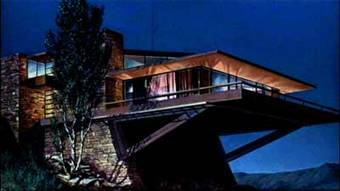 A portion of the grand tilt down matte composite from FORBIDDEN PLANET as painted by Howard Fisher with the great reactor humming away. 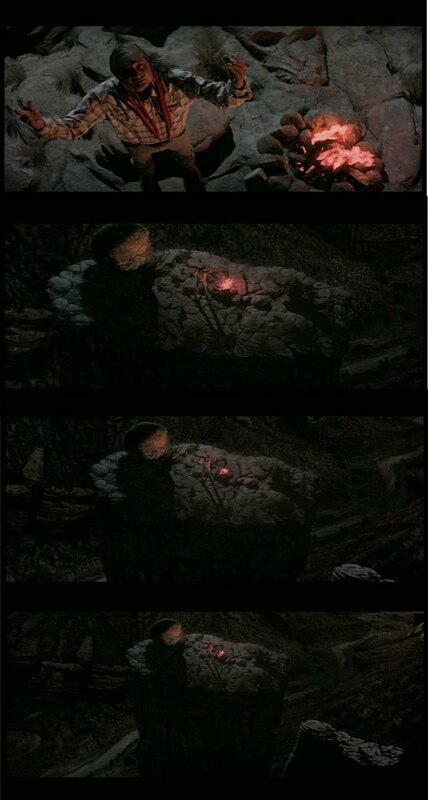 Yuricich was involved with gags and effects on this shot as he mentioned in an interview: ..."The problem we had with this shot was that the little figures coming out of the door into the big atomic furnace were so small you never saw them. They were just shot on the street outside of the MGM backlot. So I designed, into the doorway that they came through, a light above them. It was concentric circles, instead of just a beam, which were pulsating on and off as they walked through the door. Now when you first saw the image on the screen your eye would be attracted to this motion. You followed these people because you now knew they were there... otherwise you might never have noticed them unless you hang a sign which says look, here come some people". 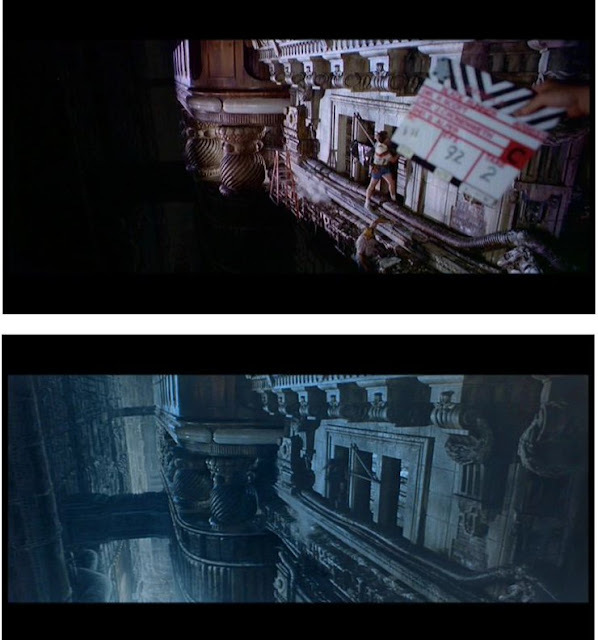 Matthew would utilise this same ingenious technique on other productions such as BLADERUNNER to help draw the audiences' eye to an otherwise 'lost' piece of action within an expansive matte. 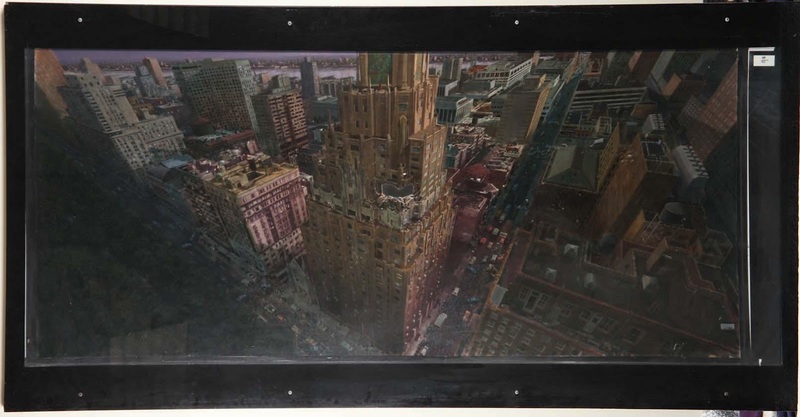 Art Director John DeCuir's wonderful conceptual painting of 'Spook Central' for GHOSTBUSTERS (1984) from which Matthew would be required to produce a vast matte painting for a key pullback shot. To facilitate the grand shot as designed, assistant matte painter Michelle Moen was charged with producing this detailed lay in for Matthew's final glass painting. Matthew's wonderful completed painting - some 8 feet wide on glass, with a tiny pocket of unpainted glass in mid building for the introduction of a rear process plate of Bill Murray and friends. 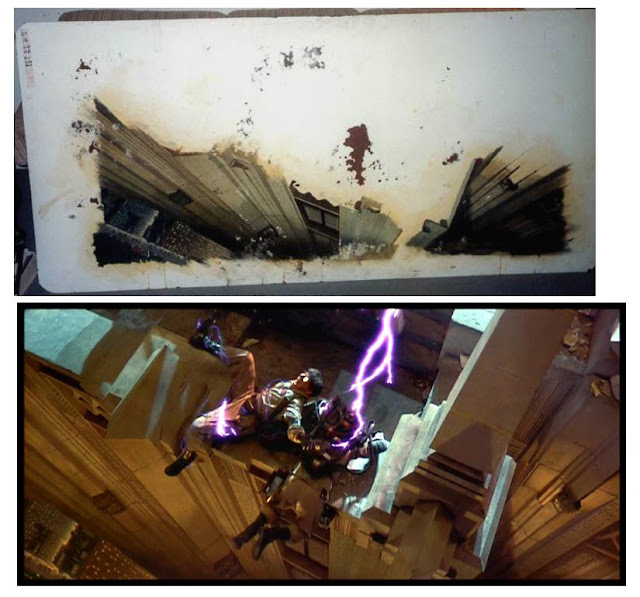 Detail of Matthew's brushwork for the mammoth GHOSTBUSTERS painting with the process screen area clearly visible. The painting sold recently at auction for I think around US$12'000. 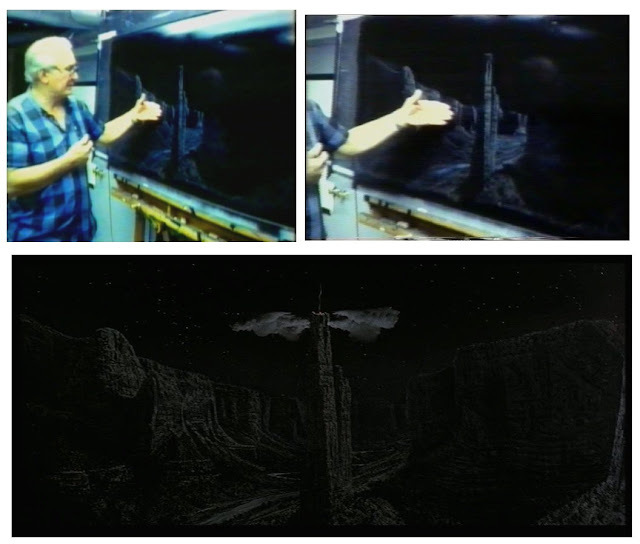 Matt in the middle stages of painting the wonderful glass shot above at Doug Trumbull's Entertainment Effects Group. 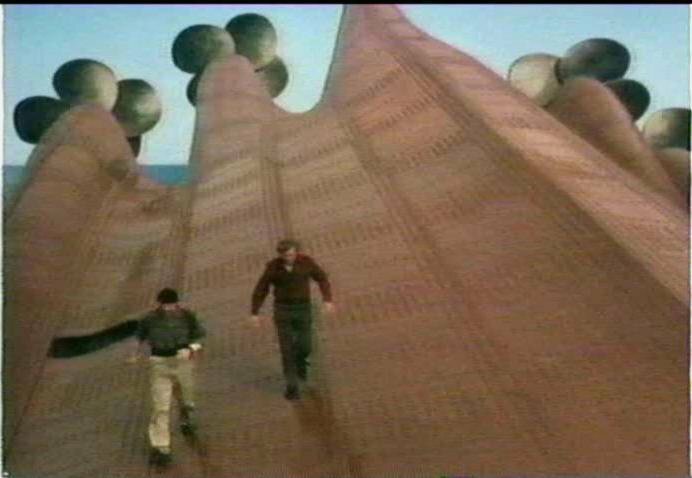 A combination miniature set, suited stunt performer and blue screened foreground actors with Matthew's painting of midground building and rooftops tying the shot together. A breakdown of the elements for the above composite shot. 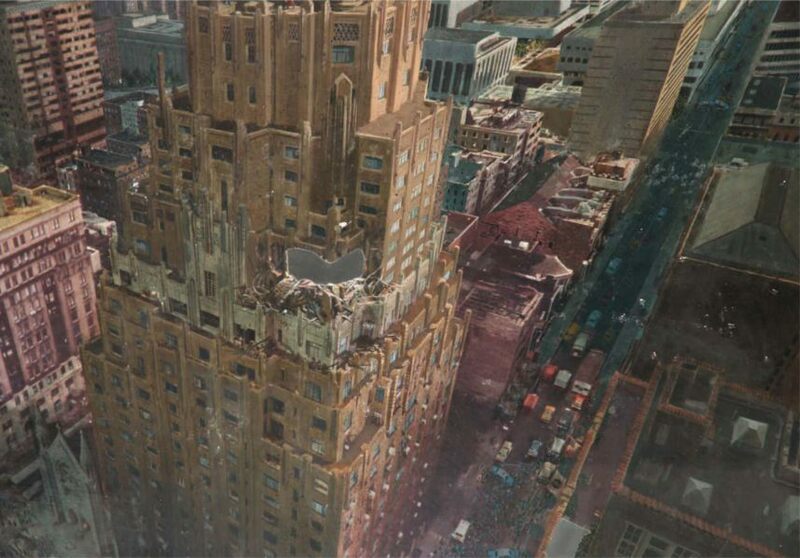 Matt's painted street and buildings form the background of another GHOSTBUSTERS composite. 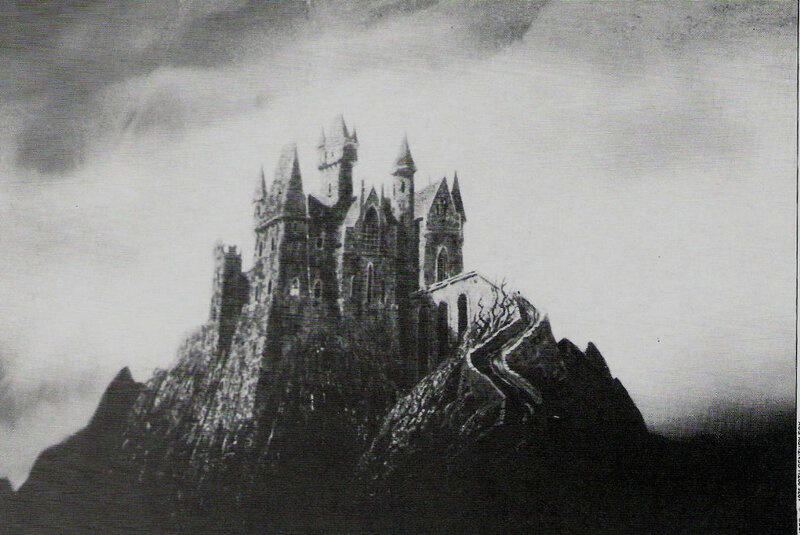 I think this film was Michelle Moen's first as trainee matte painter under Matt. 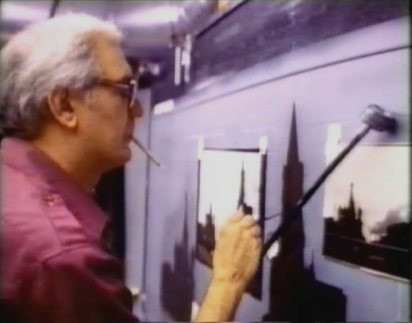 Long time Disney matte painter Constantine 'Deno' Ganakes also assisted with the many matte shots. The picture received an Oscar nomination for Richard Edlund's visual effects. 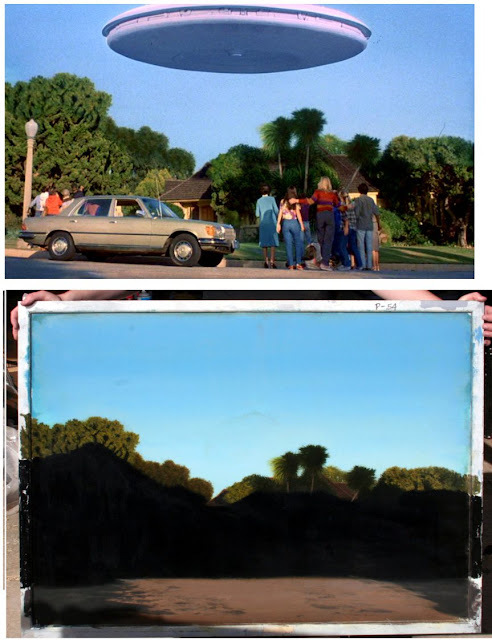 Another, rather minimalist painting forms the basis of a major set piece from the same film. 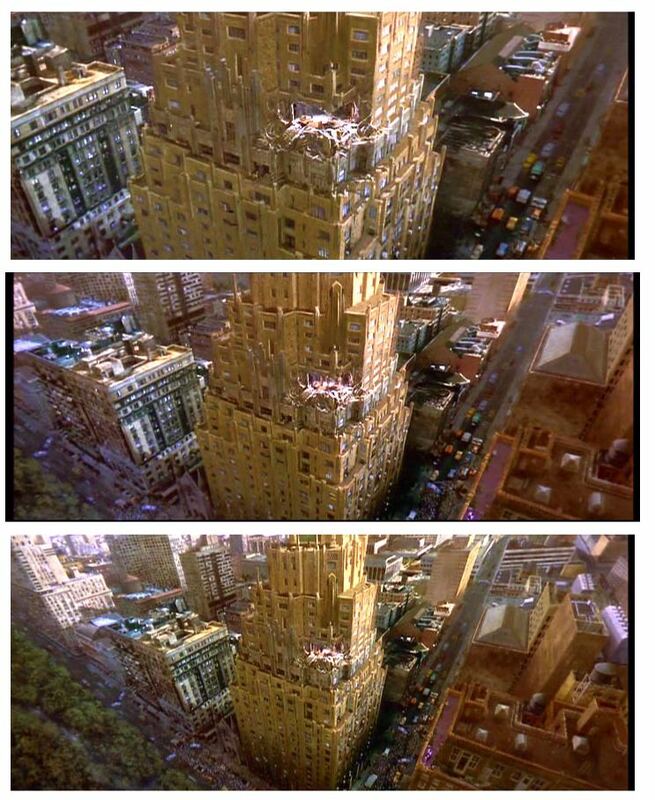 New York city skyline - GHOSTBUSTER style! 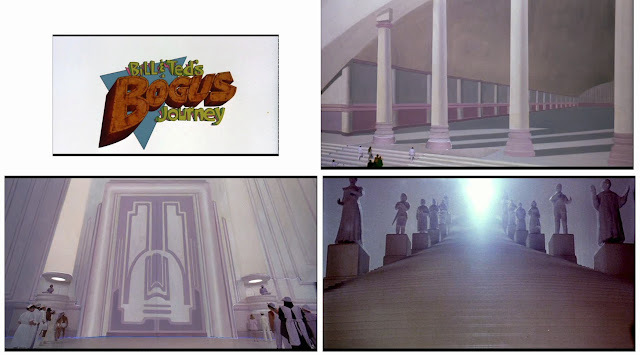 THE GREATEST STORY EVER TOLD (1965) was a superb matte shot showcase with a trio of top artists turning out many terrific shots - all of which may be seen in my special article on that film by clicking here. Jan Domela I believe painted this shot, with input from Matthew and his brother Richard. Oscar nominated for visual effects, ICE STATION ZEBRA (1968) featured some great effects work by veterans Clarence Slifer, Joseph MacMillan Johnson and Robert Hoag - with Matthew providing several excellent painted mattes. 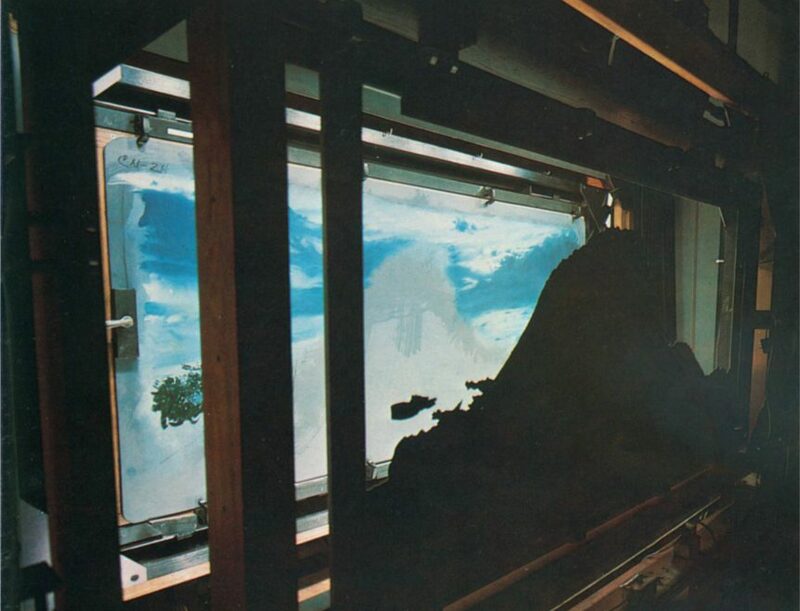 Another of Matthew's mattes from ICE STATION ZEBRA. 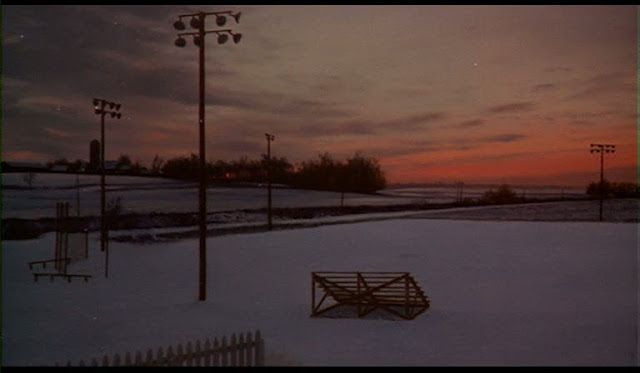 A particularly good matte shot from a fairly average melodrama - ICE STATION ZEBRA. Another LOGAN before and after. Matt at work on one of his LOGAN tv show paintings. Detail of the same matte. An interesting matte made for a Mastercard tv commercial with numerous global landmarks. 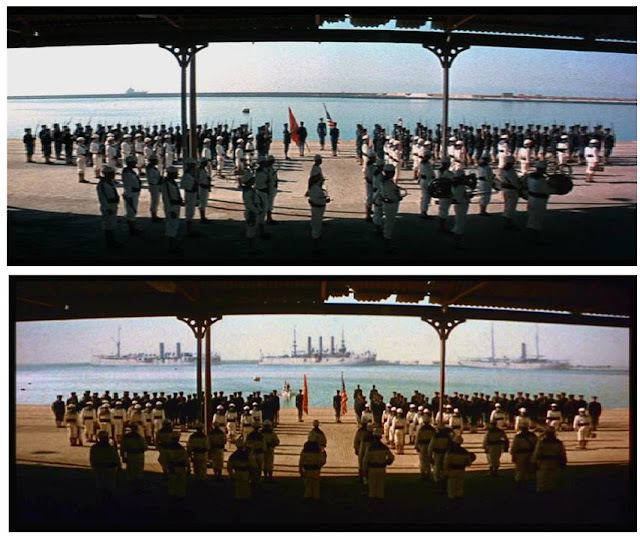 Another before and after from the same film. Matthew at work on a key MASTERS OF THE UNIVERSE glass shot. One of Matt's best shots - two separate paintings, miniature rowboat and live action foreground all assembled with a complicated pan and push in camera move by Clarence Slifer for MUTINY ON THE BOUNTY (1962). Another beautiful matte from the same film, which although nominated for the VFX Oscar missed out sadly. 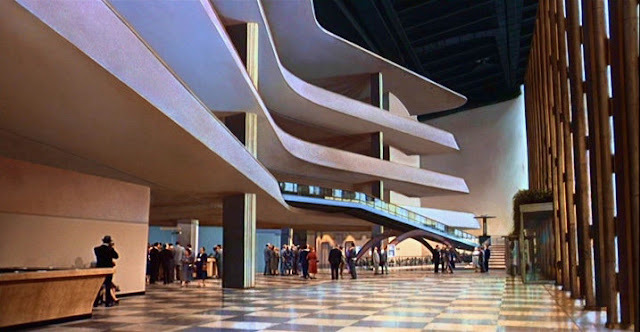 An invisible matte shot from the same picture - extras performing in front of a limited painted backing with everything else added in by Lee Le Blanc's matte dept - even the near to camera tiled floor and walls at right is matte work. Four terrific mattes of James Mason's cantilevered mountain top house from the same film. 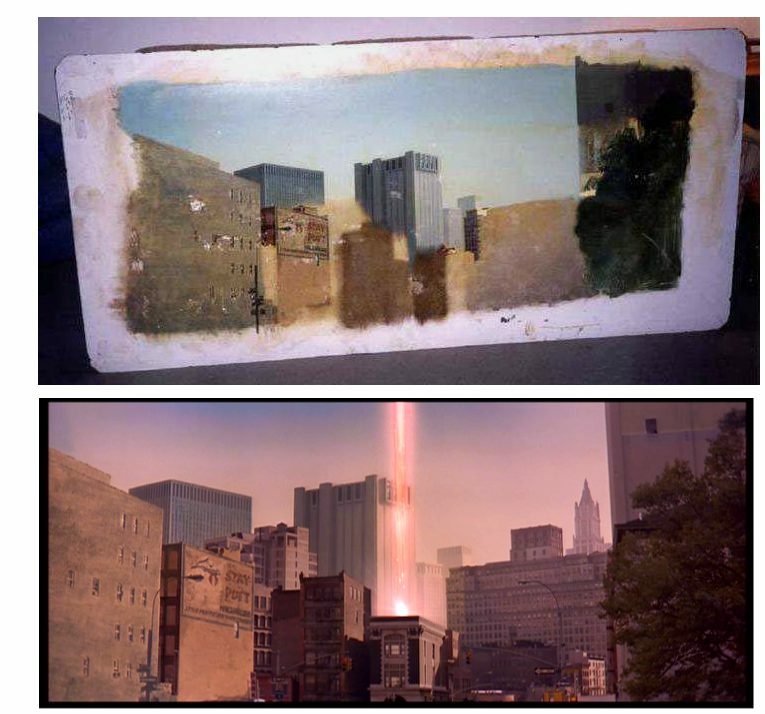 A full painting of the UN building in New York with only a tiny sliver of live action with 3 people near entrance way. 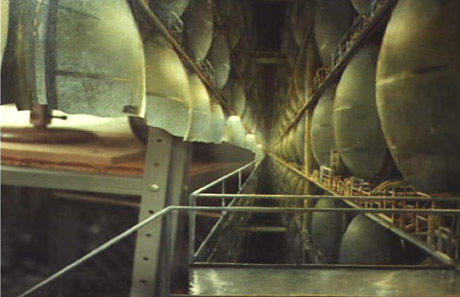 Although a few mattes were planned and prepared for THE POSEIDEN ADVENTURE (1972) this is the only one used. 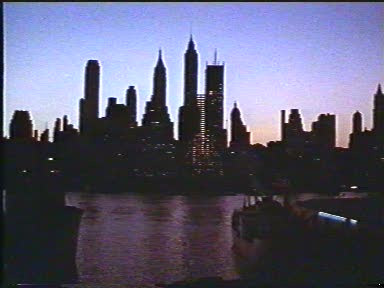 Another of the many mattes from the same film. 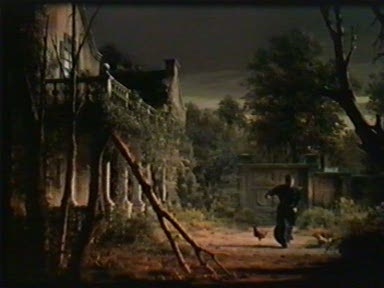 One of several mattes from SEVEN BRIDES FOR SEVEN BROTHERS upon which Matt painted for MGM. 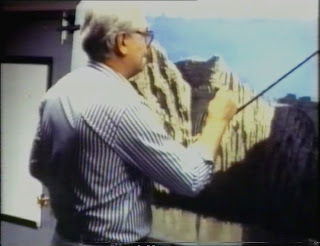 Matt seen here painting a canyon for SOLAR CRISIS at Boss Films in the late 80's. Another subtle matte cityscape top up from the same film. 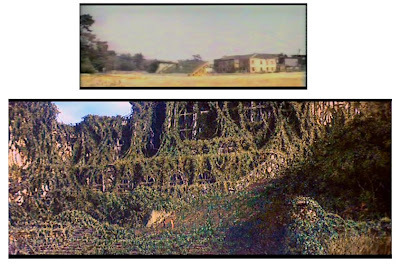 A lone Edward G.Robinson faces his destiny - SOYLENT GREEN extensive matte painting. A terrific SOYLENT GREEN painting regrettably edited out of the final release print. Early stage block in and final shot from the same film. Elevator shaft matte from the same excellent film. Actual location extended by Yuricich to add more water tanks and pumps from the same film. 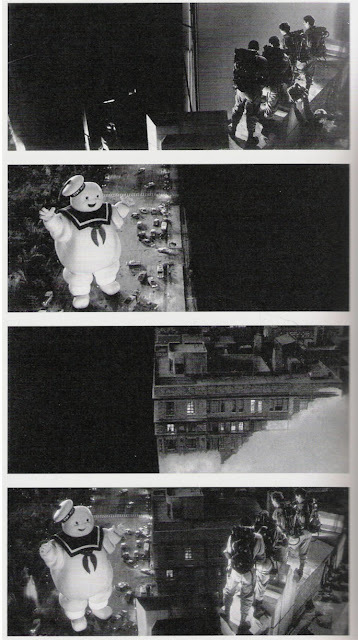 Same film - very large miniature burning tower with additional buildings and lights painted in later. Destroyed staircase and shaft painted by Matthew and bluescreen comped for that same film. Two brief views of the extent of WESTWORLD (1973) and all it offers. Great film. 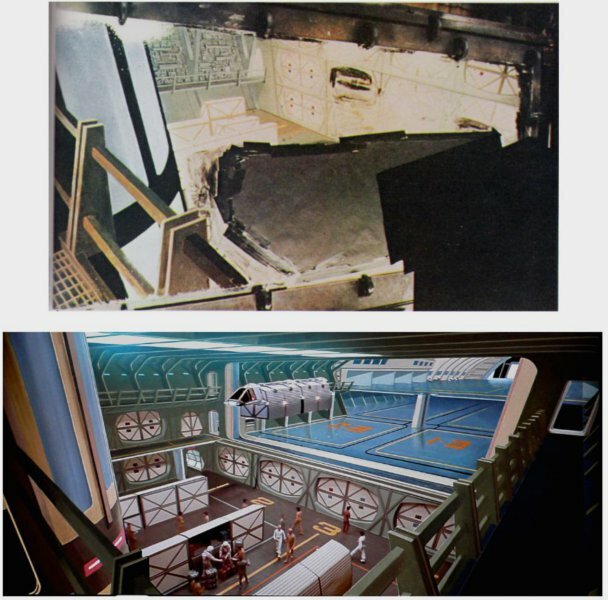 Before and after matte work also from the tv show "V"
Another of Matt's invisible glass shots from "V"
Matt's giant pullback shot from the same film, carried out at Richard Edlund's Boss Films. 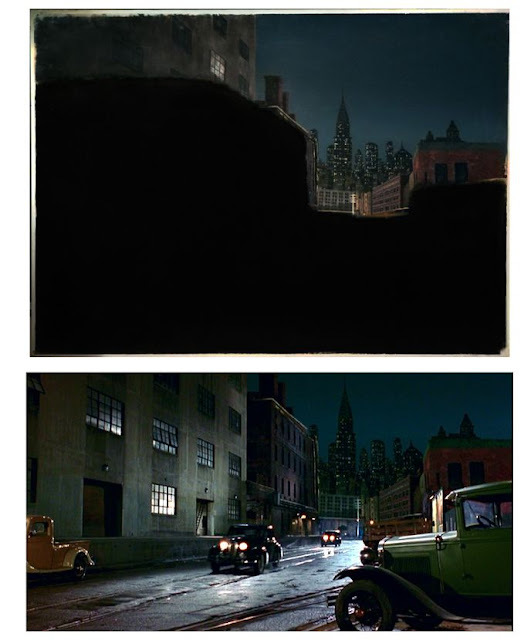 Another beautiful matte from that same film, which former assistant Michelle Moen also painted on. Matt at work on a regrettably aborted STAR TREK matte of Vulcan. Lee LeBlanc supervised the mattes for the big biblical epic KING OF KINGS (1962) for which Matthew would surely have been involved. 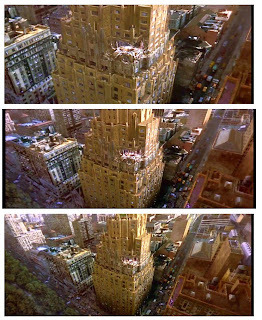 For more on the effects shots in this film, check out my special blog by clicking here.